One of the strengths of DLABMED is an MRI which allows precise diagnoses, together with additional advantages for the patient. Our MRI is open and therefore is more comfortable and ideal for claustrophobic patients. MRI allows a more detailed assessment of the osteo-muscular-articular diseases due to biomechanical instabilities as the examination can be performed in the upright position (orthostatism), with dynamic movements, reproducing in this way a real situation. Conventional MRIs commonly permit the study of the musculoskeletal system only in the supine position. This positioning cancels out the force of gravity and prevents an optimal assessment of the muscles, ligaments and tendons. However, a more targeted examination can be made with the patient in an upright position and with dynamic movement. The interpretation of an MRI report can be difficult for patient. DLABMED offers a free medical consultation to explain to the patient the meaning of the MRI report. What is Magnetic Resonance (MRI)? Magnetic Resonance is a diagnostic imaging technique used since the early 80s, which provides detailed images of the human body using magnetic fields and radio waves: the patient is therefore not exposed to any type of ionizing radiation, and for this reason it is neither harmful nor invasive. It is used for the diagnosis of a large variety of diseases because it permits the visualization of the skeleton and joints (low magnetic field machine) as well as internal organs (machines with a high magnetic field and with contrast medium). Why should be chosen the MRI “made in DLABMED”? Magnetic Resonance scans have always frightened patients because being forced to remain still inside a tube often causes anxiety, claustrophobia and distress, which can increase the risk of having to interrupt the procedure. Instead, the DLABMED Magnetic Resonance technique is “open”, as you will see in the video on the side, and combines patient comfort with high standards of image quality. With this type of MRI, even the most fearful patient can remain calm and successfully complete the examination. What is the difference between performing the MRI “lying down” (recumbent) or “standing” (upright)? Almost all current existing MRI machines permit the examination of joints only in the supine position. Since the magnet can be rotated, the DLABMED MRI machine allows the patient to be scanned in the weight- bearing upright position. This offers a new perspective in the study of pathologies for which load is a critical risk factor that aggravates these pathologies. Thanks to the wide range of sequences available, DLABMED is now able to completely and effectively cover all diagnostic needs of an articular nature. After you have been examined by the medical specialist, he or she will determine the recommended position for the scan. Scans in both the recumbent and upright position take approximately 40 minutes for each anatomical area examined, but this depends on the cooperation of the patient. The scan will take an additional 15 minutes if the medical specialist requires dynamic tests. Is this examination indicated for everyone? Magnetic Resonance Imaging is indicated for men and women, of all ages. However, there are some factors that could hinder a positive outcome: claustrophobia, anxiety, the inability to remain still for 30-40 minutes, a severe cough, pain from remaining in one position on the scan table, women using intrauterine contraceptive devices (coil), pregnant women, patients who have undergone bypass surgery, prosthetics, screws and plates inserted before 1994. The machine also has specific characteristics and is contraindicated for patients taller than 2.10 m. and weighing more than 110 kg. 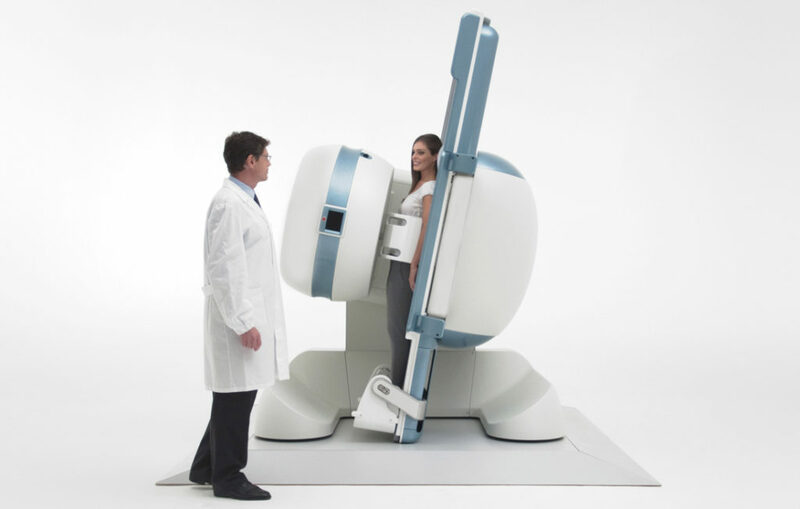 Patients with a very large abdomen may not be able to fit inside the Magnetic Resonance machine. What can cause the examination to be unsuccessful? When your case history is taken, you will be asked if you have a cardiac pacemaker, internal infusion pumps, neurostimulators, or implanted hearing aids, which could be damaged due to the action of the magnetic field. Contraindications for undergoing the scan include metal chips inside the body, metal surgical clips, prosthetic devices and metal screws. You must indicate whether you are pregnant or suspect you are pregnant, and if you have any allergies, especially to metals. For the MRI scan you can wear underpants and an undershirt, preferably cotton (however each patient will be given a sterile cloth gown). All patients will be asked to remove metal objects such as watches, chains, bracelets, hair clips, eyeglasses, earrings, wallets, etc., because the Magnetic Resonance machine has a powerful magnet. What documents should I bring on the day of the examination? For Magnetic Resonance examination you must present a medical referral from your family doctor or a specialist, completed on letterhead paper and indicating the scan to be performed, specifying in which position, and indicating whether dynamic tests are requested. It is also recommended that you bring along any records of diagnostic tests or reports from previous examinations, which could be useful in completing the MRI report. The report is normally available 3 working days after the scan was performed. You can request delivery of the results by GLS courier, with a charge of 10 Euros for shipping. However, it should be noted that if the report is to be picked up by a third party instead of the patient, the delegated party must appear at the administrative office with a valid identity document of the patient. Scan reports may be picked up from Monday to Friday between 8AM and 8PM, and Saturday from 8AM to 2PM.